Hi and welcome to our ‘new style’ Newsletter Composte, where we are mixing it up in the Community Post! We hope you enjoy reading it as much as we’ve enjoyed writing it. And when I say I would like your feedback – good or bad – I really mean it. This newsletter is for you, so we want to make sure it is relevant to you. So if you have any suggestions for improvements, stories to tell or ideas that worked for you has a host that you would like to share (more about this in WWOOF Community) please let us know. One host suggested that we should send out notifications when your registrations are coming up for renewal, now we have talked about this for a while and getting this message was the proverbial “kick up the backside” to put it into action. Please see Developments for more info. Ever wanted to be a film star?? Check out the call for help on Mainstreaming Sustainability Documentary below! As I sit here overlooking the beautiful Aniseed Valley and mountain ranges, it seems like a million miles removed from the big office block I used to work in in England. It is also hard to believe that I am actually working right now – I am enjoying myself very much! It can be difficult to keep track of memberships etc (I certainly have trouble and like to receive reminders for everything from memberships to doctor’s appointments!). So we’ve decided to send out renewal notifications a month before your registration expires. This doesn’t only ensure that your membership is current at all times and ready to go in the reprint of the book, it may also give you a little reminder to maybe update your profile and add new pictures. Also, there is no need to give us any notice if you don’t want to renew or don’t want to be in the book. When your membership has expired we will take this as notice and won’t print your details in the next book. You can renew at any time using the same process as before by logging on, going into your profile, clicking on account and then choosing your preferred option! The Forum has been going for almost a year now and it’s really great to see so many of you are using it now. I recently had a suggestion from a host, which is to include a host2host section on the website. Unfortunately, that has to be quite a longterm goal as it involves some major website development. However, I think this is a great idea, so maybe you can organise meetings with other hosts in your area to exchange ideas and discuss what works and doesn’t. Two topics spring to mind “How to reduce the chance of WWOOFers not arriving” (check out the thread on the Forum) and “Ensuring feedback is placed”. These are just my thoughts and I’m sure you can think of loads more. There is of course nothing that says the meeting can’t be held at a local pub over one or several alcoholic beverages! I leave it up to you to let me know what you think and of course we are more than happy to assist in any way we can. We look forward to receiving the feedback from the first meeting! Eco-families wanted for up-coming documentary – Mainstreaming Sustainability Kindle Films Ltd are aiming to produce a ground-breaking documentary that showcases all the amazing things families are doing throughout thecountry and showing mainstream New Zealand families that living sustainably is viable and fabulous! They are heading around Aotearoa from September to March filming families with children who have farms, orchards, make products, recycle materials for furniture-making, clothing, jewellery. The enterprises need to be sustainable, eco-friendly and the children need to play some role (big or small) inthe business/lifestyle. If you’re keen, or know families who would be, please contact Emma. People can view our two previous films for children promoting NZ Nature and Creativity at www.oursdvd.co.nz . If you have any interesting, funny, cool photos we can use to refresh the website and book cover, we’d love to see and possibly use them! The new books have all been posted to those who ordered them. Please let me know if you ordered and haven’t received yours. 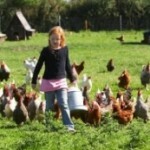 Below is a link to the ‘News from the world of wwoof’ which you may find interesting.